If it wasn't obvious from the title, we're going small this week in the gaming sector. Handheld, to be specific. 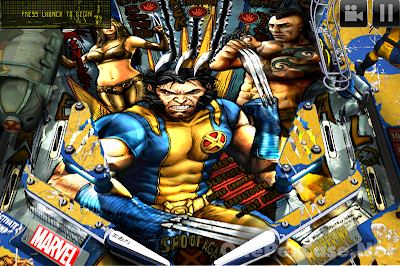 Zen Pinball HD is a mobile game available for free in both the Apple and Android Play Stores. Pinball is a game that is tailor-made for mobile control schemes. It's easy because there are only two buttons, left and right. There's no getting shot to death while you try to find the 'right' button with your thumb. Tap the screen in the bottom left corner, the left flipper(s) go off. Tap the screen in the bottom right corner, the right flipper(s) go off. Simple, right? Zen Pinball HD comes free with a pretty fun game called Sorcerer's Lair (seen above). If you manage to get a ball up to the sorcerer, he vaporizes it with, I'm assuming, sorcery. There are multi-ball portions once you've plugged enough balls into a particular hole (I know, I know, but you think of a better way to say it!). Ghosts appear at one point that you must defeat in a period of time for a bonus by rolling them over with the pinball. There are even some mini-games that I only half understand. Something about gears and a green ball? Anyway, for a free game, I haven't played a better mobile pinball app. this is how they getcha! Although I'm sure it came as a great shock to you, dear readers, they also offer add-on tables for $1.99 each. I'm a Star Wars nut and I was unable to withstand the Dark Side. I was born the same week Star Wars Episode IV came out so I really didn't have a choice in the matter. I'm the definition of a Star Wars baby. Short story long, I bought the Episode V: Empire Strikes Back table and the Boba Fett table. All I've done is play these games for the last two weeks. I've turned off my 360 just to play this game, which is rare for me with mobile apps. Zen Pinball also offers Star Wars: The Clone Wars for fans of the newer movies. I probably enjoyed them more than most people, but even a die-hard fan like me knows the first three movies were better. They also boast several tables based on Marvel characters including Thor, Wolverine, the Hulk (or the Credible In-Honk as I referred to him at the tender age of 3), X-Men, Avengers, Captain America, Ghost Rider, and then a few others I didn't recognize. My point is, you could end up blowing almost fifty dollars on tables if your habit is bad enough. I may end up grabbing Wolverine and Hulk once I've mastered Empire and Boba Fett. The Empire Strikes Back table has tons of references to the consensus best of the Star Wars films. If you manage to put the pinball through a door in the middle of the table five times, one for each letter (V-A-D-E-R), Darth will rise up out of the table and roll off quotes from the movie. "Join me, and together we can rule the universe as father and son." If you hit the pinball at him, he quickly dispatches it with his light saber. If you manage to hit certain spots enough times, you're offered six different story lines that bring up memorable parts of the movie. One scene brings out asteroids and two tie fighters that fly around shooting at your pinball. Another has Yoda training Luke by doing a handstand while lifting rocks with the Force. A third brings out a storm trooper who fires at your ball with a blaster. For fans of the movie, each one brings back fond memories of George Lucas' classic film. On top of that, it's a top-notch pinball game that's as good as any real-world table that I've played. The Boba Fett table could also be called Return of the Jedi, although there are a few quotes sampled from Episodes I-III. At the top of the table is the Sarlacc pit. Shooting three balls into Slave I, Boba Fett's ship, will bring on multi-ball. You start the game with one missile, but by increasing your score you can gain more. These are fired by Boba Fett at one of the "job" spots. By hitting these you take on a bounty and have to hit specific spots to complete the job. Boba constantly flies around the table using his jetpack. He does his best to avoid being hit by the pinballs. He also fires at your ball as it rolls around the table, but unlike Vader's light saber, it doesn't destroy the balls. As you can see above, one of the "spinners" on the table is Han Solo frozen in carbonite as he appeared as Jabba's finest decoration in his palace. Jabba sits in the upper-right corner of the table and also appears in a cutscene when you're given a bounty job, again drawing direct connections with Return of the Jedi. I still haven't managed to get the Sarlacc pit to pull Fett down as it is doing in the above picture, but I'm not going to stop until I get it to happen! I'm not the biggest mobile gamer in the world. I usually prefer my Xbox 360 to my GS3 for gaming, for obvious reasons. The Samsung has a nice, big screen, but it pales in comparison to my 50-inch HDTV, nevermind the difference in controller abilities. However, every once in a while a mobile title grabs a hold of me and won't let go. Zen Pinball HD, especially the Star Wars tables, have done just that. I'm a big fan of real-world pinball and I plan to have several tables in my house once I'm rich and famous. Until that day comes, Zen Pinball HD is a pretty good substitute. If you're looking for a fun mobile option other than Angry Birds and Temple Run, try out the Zen Pinball HD free table. But don't come crying to me if you end up spending a bunch of money on their other 22 pay tables. That's on you. Bonuses: +1 for the realistic physics that recreate the experience of playing real-world pinball tables very well. +1 for such a large number of table options, especially the multiple Star Wars tables. Penalties: -1 for charging two bucks for each new table. It's not that I don't think they're worth it. It's just a bit high when compared to the average price of most mobile titles, especially when you consider you can spend nearly $50 to buy all the available tables. I could see some mad parents out there reprimanding their kids when they get the phone bill. Nerd coefficient: 8/10. Well worth your time and attention.